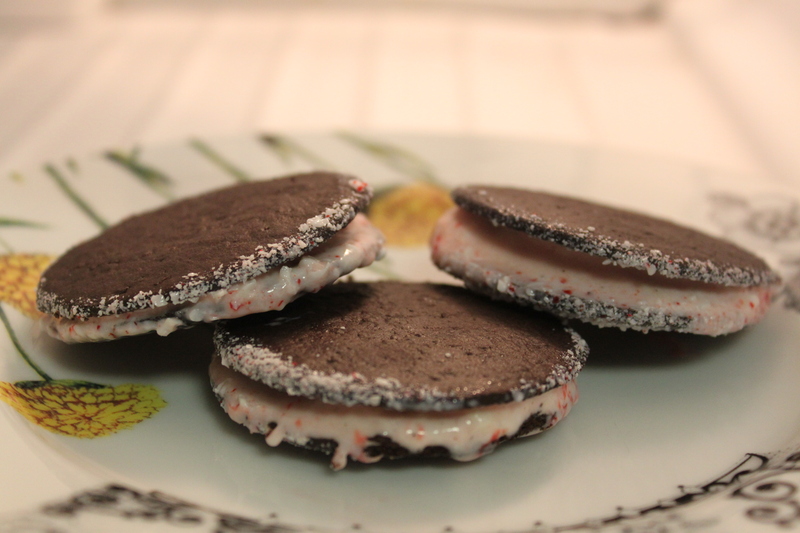 1 pint premium vanilla ice cream, 1/4 teaspoon peppermint extract, 1 cup finely crushed peppermint hard candies, and chocolate wafers. 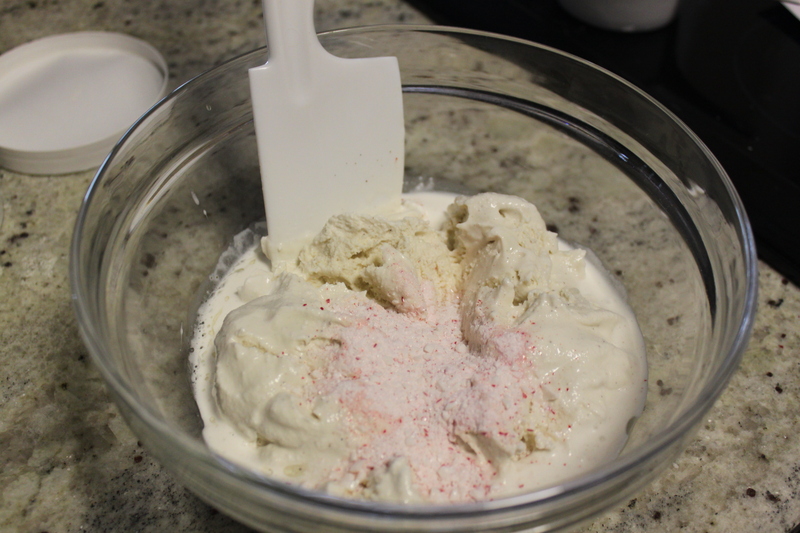 Mix the first three ingredients together by crushing the peppermint candies and mixing 1/2 cup of them with softened ice cream and extract. 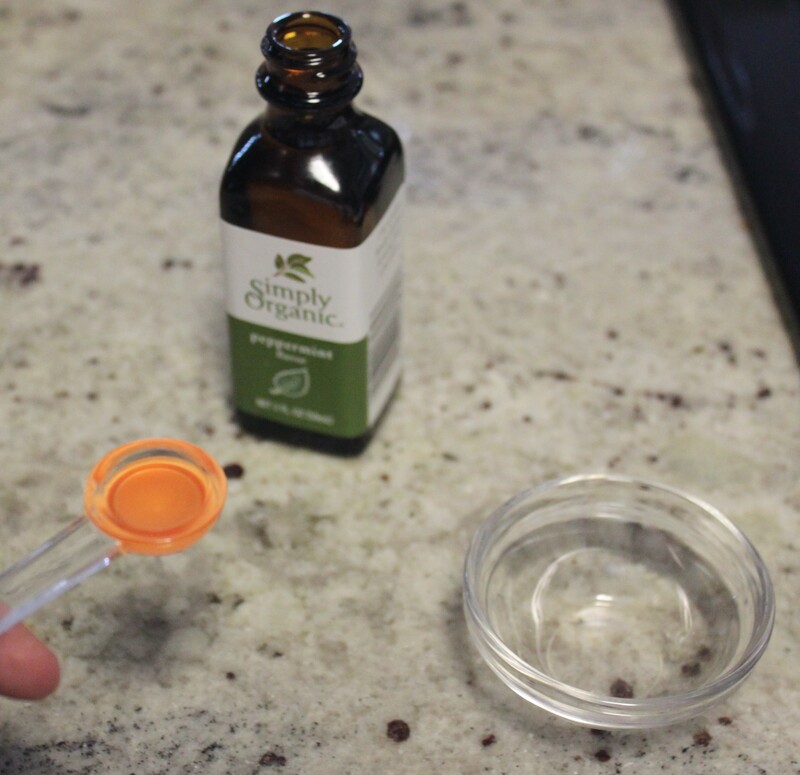 Make sure you do not use more than 1/4 teaspoon per pint. 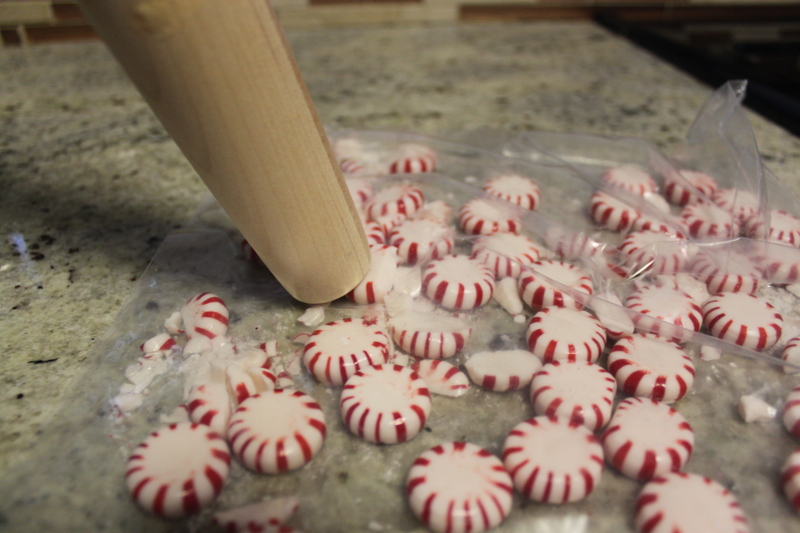 Initially I tried to crush the candies by putting them in a ziplock bag and using the end of a rolling-pin. This will work but it will take a lot of time. 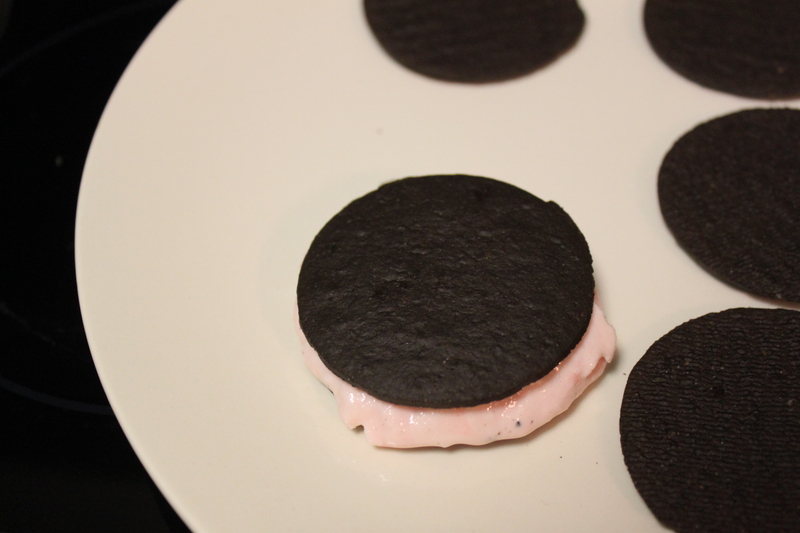 Then I wised up and just threw them all in the blender and it took less than a 3 seconds. See…crushed perfectly. 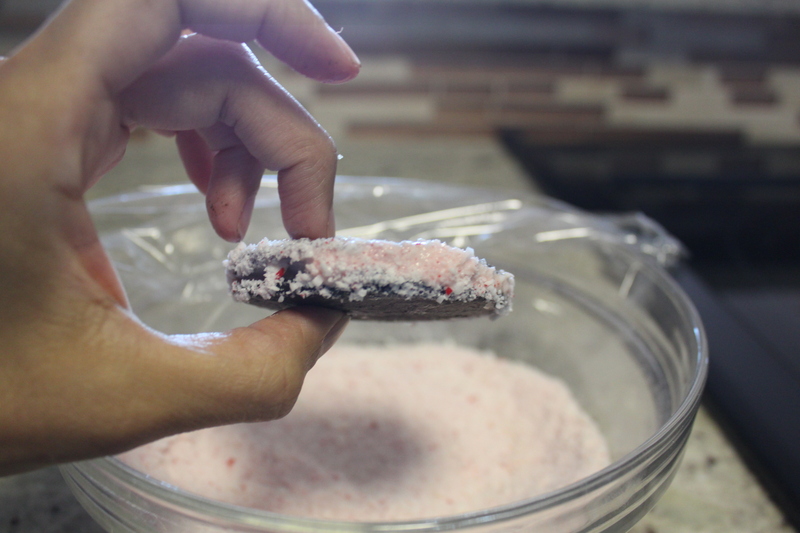 Although it looks better to have bigger chunks of the peppermint candy it does make it hard to eat as the chunks can get chewy. 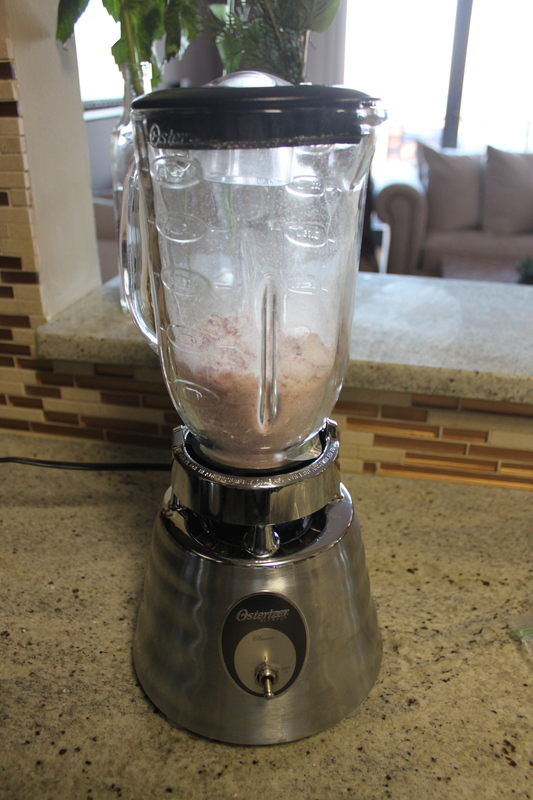 Make sure the ice cream is slightly softened to make the mixing easier. I let mine get a bit too soft. Then scoop it back into the pint container and let it harden for about an hour or so in the freezer. 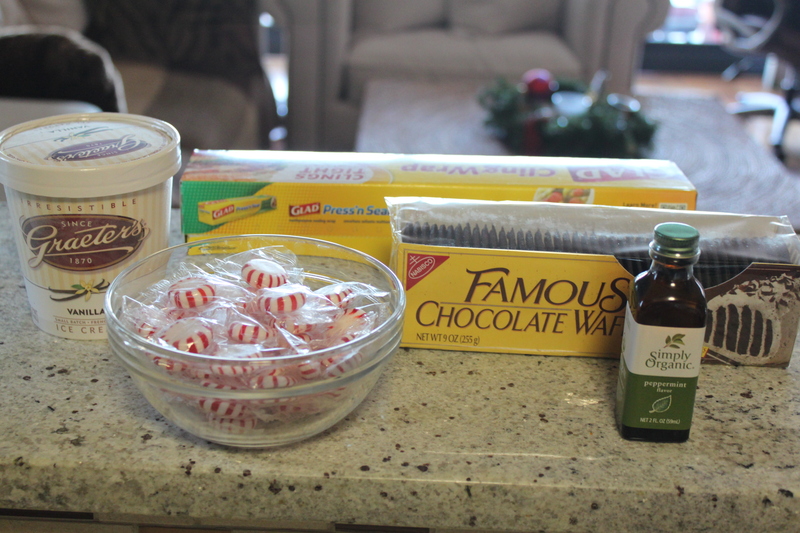 The recipe says to work quickly when scooping the ice cream on each wafer, topping with another wafer and then wrapping in plastic wrap and freezing until firm. 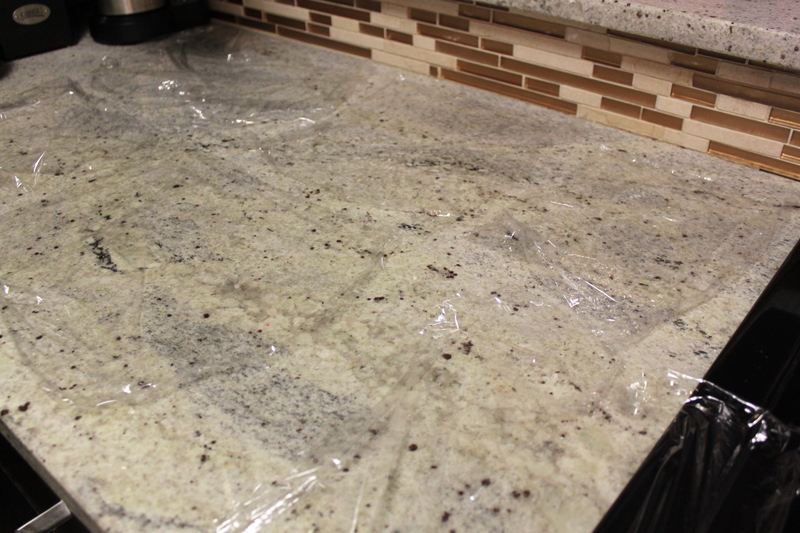 I do not work quickly in the kitchen and given my relationship with plastic wrap I thought it would be a good idea to rip off the wrap for each cookie ahead of time. 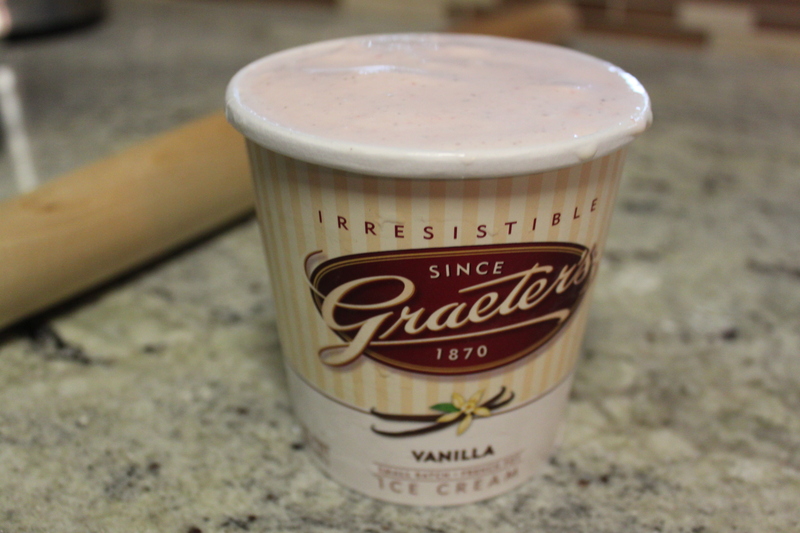 The recipe calls for using 1/4-cup ice cream scoop. 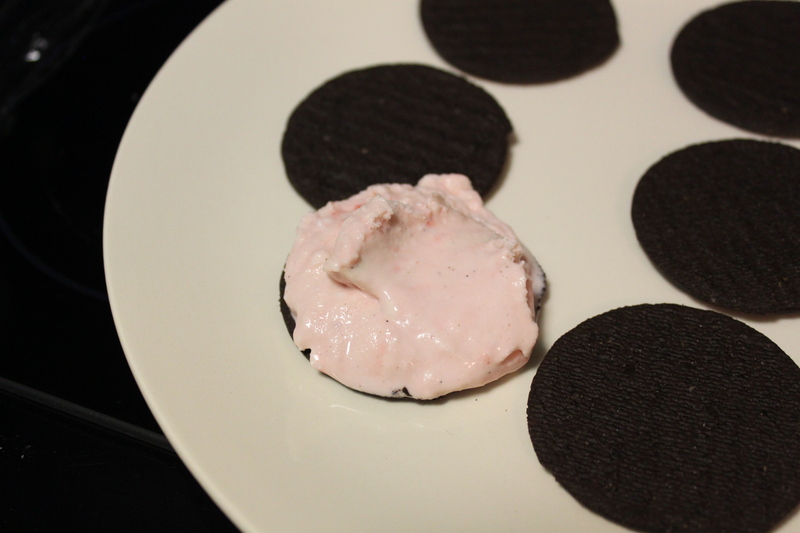 However, I found this way too big for the wafer size and used a large spoon instead. This way you can also get a lot more sandwiches. 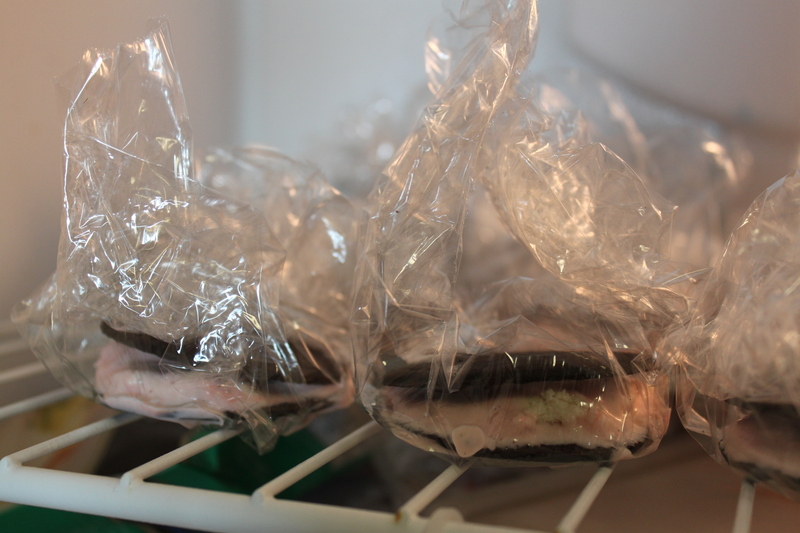 To help keep it cold I put the pint of ice cream back into the freezer every time I wrapped up each cookie. Then would take out the pint as I was putting in the wrapped sandwich. The sandwiches should stay in the freezer for about an hour. Then take them out, unwrap and roll in the crushed candy. 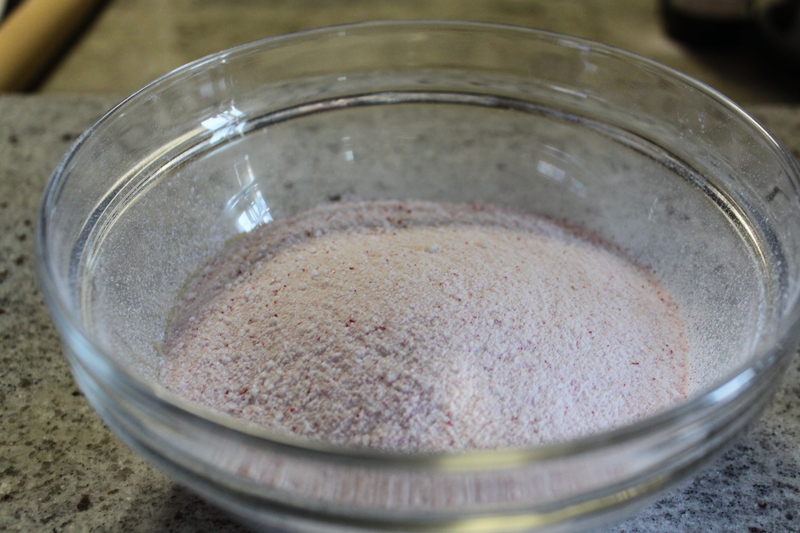 Of note, the recipe calls for 1/2 cup of crushed candy for rolling but I did not even come close to using this amount. I definitely used 1/2 cup to mix in the ice cream. Wrap them back up and put in the freezer at least an hour or until ready to serve. Voilà, you have just created deliciousness to share with lucky friends and family. I will say that if you let the ice cream get too soft it will be a messy experience. When I make these again I will not let the ice cream get as soft and I will wrap the individual sandwiches very tightly so none of the ice cream seeps out of the sides and under the wrap. But even if you make a mess, it really doesn’t matter because these are so good no one will notice. Original recipe is from Epicurious and can be found, here.